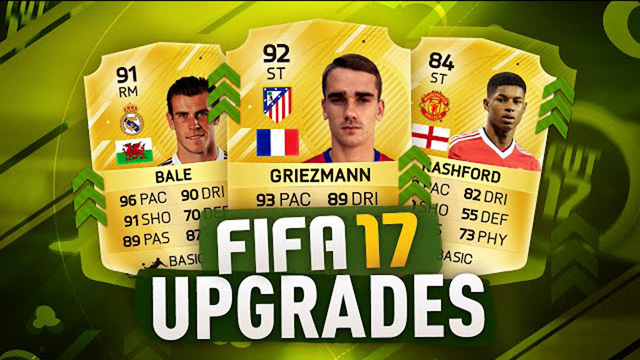 FIFA 17 upgraded players cards are released with stats increase based on players' previous excellent performance. Typically, the cards will be released twice in ultimate team, summer and winter upgrades. During the upgrade season, when a player is upgraded, the cards rating and attribute will be increased. Also a regular new card is replaced with the old one, which can exclusively be found the existing clubs and the transfer market. It is same that if you want the improved version, you have to buy. This time, for players in FIFA 17 ultimate team will come across the winter upgrades, which probable come after two months. FIFA Winter Upgrades, also known as January Upgrades, are usually updated into FIFA Ultimate Team (FUT) around February 15th. Bronze, Silver, Gold and In-form players in-game and card stats are upgraded based on their performances on real life patch. There could be 350 upgraded cards in FUT, which could be released in 4 different batches, perhaps once a week during a month. While summer upgrades take place within the transition of one FIFA to another looking to reflect the players' evolution between two seasons. It has been mentioned that upgraded players cards will receive the boost on the rating and stats. It is generally that 1 or 2 points boost in the gold cards. At least 4 points are given to silver and bronze players. For the price of the upgraded players cards, we know that once the quantity of the cards is large, the value of the cards will fall. As for the investment in IF cards, it can be highly risky with possible large profits because the bigger the player's rating and popularity, the bigger is the IF card's appreciation. Q1: Why are there some In Form cards that didn't receive an upgrade although their NIF did? Because it is probable that the upgraded player's new OVR rating does not equal or surpass his existing in-form's rating. If it does, then it is because the upgraded player with an existing IF gets upgraded across Quality tiers (eg. Silver to Gold). Q2: Why wasn't a certain player's IF card upgraded if his NIF and UP were of the same category? It might be the reason that IF card already had the maximum rating for its category: 64 or 74. Q3: What kind way to predict which players have good chances of receiving an upgrade card? Two ways, the number of a player's IF cards; constant rating upgrades on H2H. Q4: How long will the cards be available in packs? They will be stay in packs until the end of the game, replacing the day 1 cards. If you want to invest the IF cards before the upgrades, I guess you have to afford high risk to get profits. In the late period, we will get the winter upgrade predictions to you. Stay tuned. For more FIFA 17 coins to invest, you can get with cheaper price here.